NETWORK UPDATE: BLUE BLOODS gained 0.1 in final numbers. CABLE HIGHLIGHTS: Discovery’s GOLD RUSH topped Friday cable, down 0.04 from last week to 1.05, with lead-out PACIFIC WARRIORS up 0.06 to 0.41 (possibly helped by an unusually long 4-minute overrun for GOLD RUSH into PACIFIC’s hour), and lead-in GOLD RUSH: THE DIRT at 0.35. ESPN’s NBA doubleheader was at 0.67/0.66, down significantly from last week’s 0.91/0.87. Disney had a pair of shows in the Top 10, GIRL MEETS WORLD at 0.67 and SOFIA THE FIRST at 0.42. 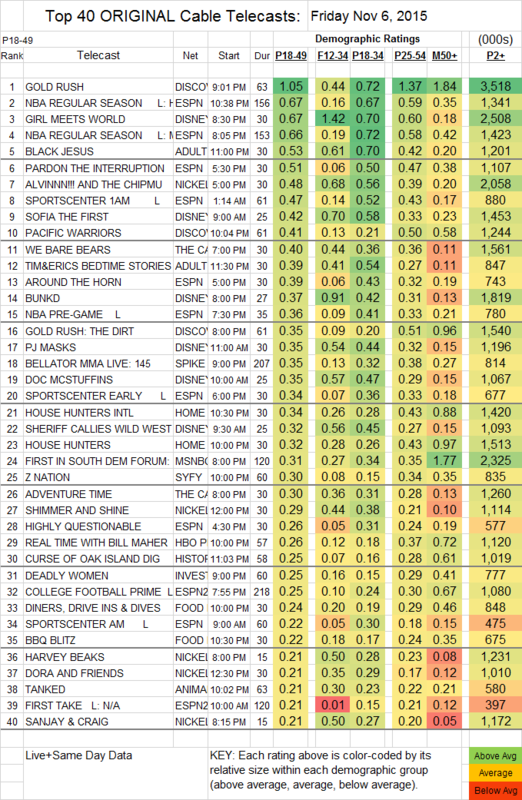 Adult Swim’s BLACK JESUS was up 0.07 to 0.53, and TIM & ERIC’S BEDTIME STORIES returned at 0.39. Nickelodeon joined Disney in the Top 10 with ALVIN!!! AND THE CHIPMUNKS at 0.48, and Cartoon Network’s WE BARE BEARS was close behind at 0.40. Spike’s BELLATOR MMA LIVE was at 0.35. On Syfy, the newly-renewed Z NATION fell 0.07 to 0.30. HBO’s REAL TIME WITH BILL MAHER gained 0.06 to 0.26. USA’s SATISFACTION inched up 0.01 to 0.18. 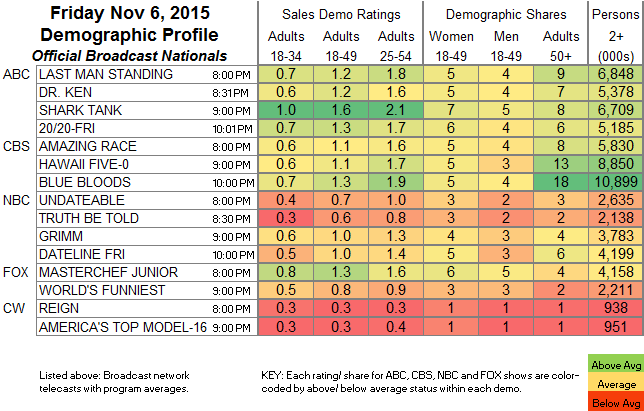 On Lifetime, STEP IT UP dropped 0.04 to 0.17, and JACKSONS: THE NEXT GENERATION downticked to 0.14. Cinemax’s THE KNICK kept falling, down 0.02 to 0.03 with 166K total viewers.